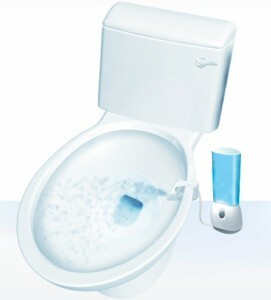 Break free from the drudgery of toilet cleaning with the new Scrubbing Bubbles® Automatic Toilet Bowl Cleaner. It cleans your toilet three times a day, tackling unsightly toilet rings, hard-water marks, limescale and other stains. Best of all, it’s completely automatic, so it does the dirty work for you. So reads the promotional material for the new Scrubbing Bubbles® Automatic Toilet Bowl Cleaner. Now I am all for anything that makes household chores easier, especially those involving the inside of a toilet bowl. As a new daddy I do quite enough poo cleanup already. Yes, real men do change diapers. This product is great; what I find disconcerting, however, is how well the mad men at whatever ad agency came up with this product know me. 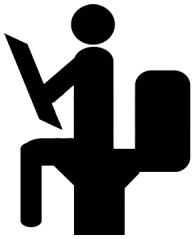 Here’s what I mean: The installation instructions include a warning that the “built-in sensor that prevents spraying while the toilet is in use may not work if one is seated on the toilet for 30 minutes or more.” This warning is accompanied by a drawing of a man reading on the toilet. I resemble that remark! [blush] As for the Scrubbing Bubbles® Automatic Toilet Bowl Cleaner, my wife installed it and it’s working great… during daddy’s non reading time. *Note: This is not an ad and I’m in no way compensated for this post or the resulting embarrassment it will surely cause me. If you need me I’ll be in the bathroom. Go ahead… rub it in. Leave a comment! LOL. I’ve never felt so clean and fresh! is it possible to get in saudi arabia? Sorry, Riya, but I don’t know. Best wishes from Texas. Let me know how it works too! Hoping you won’t get sprayed! Your welcome, Nicole. May I call you Nicole2? Our other friend Nicole just commented above you. Fortunately our third friend Nicole goes by Nikki or you’d have to be Nicole3. 🙂 As for your thanks, no problem. I’m just happy I was able to humiliate myself for your amusement. I love that they had to include a picture showing how to spend your time on the toilet. That’s what really made me laugh. I re-created the graphic, as I didn’t have a scanned copy, but it’s pretty much what they used on their instructions. Too funny. I probably would not otherwise have noticed the fine print about not sitting on the toilet for more than 30 minutes at a time. I know it’s “toilet humor”, but sometimes ya just gotta laugh. Thanks so much for stopping by! Right? It needed on of these over the diagram. Of course if it did go off while one was still seated it would at best provide a bit of a surprise… and maybe a bit more chemical cleansing than one might prefer. Haaaaaa ha! So funny! I am finding humor in other item instructions as well. Hmm maybe one day I’ll get up the guts and follow your example. 🙂 Thank you so much for you feedback on my post today! Great to hear from you. Thanks, Esther. I’m not sure that “guts” is the right word, but if you get enough of whatever it is, post away. 🙂 Everyone can use a laugh now and then. Glad I could be there for you. Have a great day! I don’t think it’s for sale in stores yet. You can buy it online, though. As for the instructions, they just struck my as funny. And laughter is a good thing. Hope everything in Georgia is going great. Thank you so much for stopping by, Rose. LOL. I’ve heard of those, though I’m not sure I’d trust anything mechanical around my dangley bits. Hmmm. That said, if I had one of those I’d probably never leave the bathroom except in search of new reading material and a snack. Thanks so much for dropping by! Have a great weekend. Funny post. We have four little kids, and one thing I always joke about is missing the uninterrupted 45 minutes that I used to spend going numb-legged on the toilet. But I’m not really joking. Good stuff. Nice to read some other dad perspectives. Thanks, Chase! The hall bath is really one of our last bastions of man space in the home, not counting the garage, I guess?